surgery on my left hand and wrist last friday went well, but card making is more difficult with a cast, as is typing with one finger. however, i am determined to continue creating when i can. 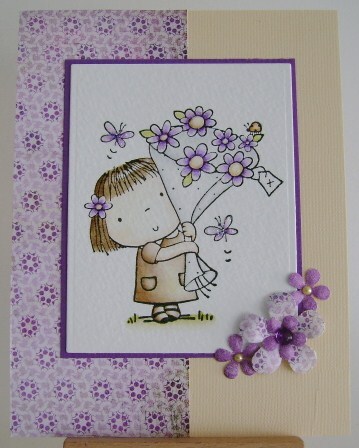 the penny black saturday challenge is purple, brown and cream – my daughter cut, punched and glued, while i watercoloured. thanks for popping by. Fabulous card for being done one handed!! Hope you heal quickly! Linda, your card is so pretty. It’s amazing that you can make purple, brown, and cream look so beautiful together. How sweet of your daughter to help you with your cardmaking. I’ve missed seeing your cards so I’m glad you’re on the mend. Oh just lovely , Linda!! I hope you heal quickly -and that you notice a big improvement! Gorgeous card! Love it….so sweet. Your determination inspires me. Continue to get well my friend!! Another pretty card from you, Linda. Even in a cast, you produce beauty! Awwww! What a sweet, sweet image and so beautifully colored! Hope you recover from you surgery quickly! What a sweet DD to help you with cutting the cardstock!